To read the full proposal, see below or visit the BMJ website. To access our economic analysis and supplemental materials, click here. To read PNHP’s press release, click here. To read and view media coverage of the proposal, click here. Click on each section to see text. While many recognize the need for change, proposed remedies vary3,11-13 and would fall short of achieving the fundamental reform that these deficiencies call for. The advocacy organization Physicians for a National Health Program therefore encouraged a working group of US and Canadian doctors, scholars, and advocates (the US/Canadian Pharmaceutical Policy Reform Working Group) to come together to craft a wide ranging reform proposal for both nations. Although political circumstances, including the influence of the pharmaceutical lobby, make full implementation of these reforms unlikely at present, shifting political winds may bring a more favorable policy climate. Hence, the working group aimed to craft an ambitious proposal for pharmaceutical reform to set an agenda for the future, including insurance coverage, pricing, drug development, clinical testing, regulatory approval, postmarketing monitoring, and promotion. To improve access and population health, we propose universal,29 first dollar coverage (full insurance with no cost sharing) of all medically necessary drugs, echoing Archie Cochrane’s famous invocation that “all effective treatments must be free.”30 Each nation should establish a national formulary of covered drugs, which should include all medications shown to improve the length or quality of life—or the safest, most effective, and least expensive option when equivalent agents are available. A national technology assessment office would provide data on comparative effectiveness to guide formulary decisions. When clinically appropriate—eg, for allergies or other unique circumstances—off-formulary drugs should also be covered. While negotiations and a national formulary could reduce prices for many medications, when patented drugs lack competitors firms could still demand unreasonable prices, forcing nations to exclude the drug or strain their budgets.42,43 Hence, additional options to assure reasonable pricing are necessary (fig 2). For instance, if price negotiations over branded drugs failed, governments would issue a compulsory license to allow generic manufacturing, a mechanism already sanctioned under international trade law,44 US patent law,45 and the Bayh-Dole Act.46 Indeed, in 2001, both the Bush (US)44,47 and Chretien (Canada) administrations,48 facing fears of anthrax bioterrorism, threatened to break the patent on ciprofloxacin, causing Bayer to lower the price. Finally, drugs developed through public funding by public entities would remain unpatented and available for generic manufacture worldwide at greatly reduced cost. The patent protection and market exclusivity that prop up drug prices are typically portrayed as critical to encourage innovation. This portrayal is misleading for two reasons. Thus, we propose the repeal of Bayh-Dole to keep drugs developed with public funding in the public domain. Meanwhile, for drugs developed fully by the private sector, the patent system should be reformed to encourage innovative drugs, not more look alike, “me-too” agents. 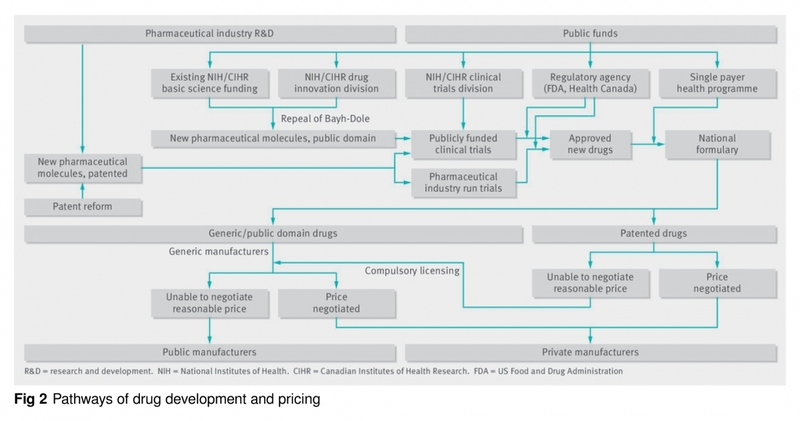 The drug innovation divisions might do some drug development themselves but would mostly fund efforts by academic or other non-commercial investigators. Priority would be given to potential drugs with the most clinical value, focusing on diseases that are neglected, commercially unprofitable, lacking effective treatments, or important for public health. The new, unpatented agents could be produced as generics by companies anywhere—a major advance for global health. Drug regulatory agencies must therefore raise evidentiary standards. Trials should, whenever possible, compare new agents to existing therapies and use a superiority design to discourage investment in unneeded me-too drugs. When new agents mimic existing ones, they should generally be tested in patients who do not respond to (or tolerate) existing products. And with infrequent exceptions, trials should assess hard clinical (rather than surrogate) outcomes.71 Anonymized patient level data from all trials (including older trials), should be made publicly available70 (whether or not a drug gains approval) to facilitate accountability and further research. Finally, because of concerns regarding the objectivity of industry funded trials and the need to test unpatented and unprofitable therapies, the clinical trials divisions within the new NIH and CIHR institutes would also fund and oversee trials (fig 2).69,72 The divisions would select promising molecules developed by non-profit laboratories, academic investigators, and drug companies for clinical trials, which would mainly be designed and conducted by non-commercial investigators. They might also fund trials assessing new indications for existing agents or non-drug therapies. Publicly funded trials would offer important benefits: minimizing commercial conflicts of interest; redirecting research from “me-too” drugs toward real innovations, and facilitating the development of unprofitable but essential treatments.69,72 Although firms could still fund trials of their products,72 because clinical trials are costly and would be subject to enhanced regulatory scrutiny (based on past evidence of companies manipulating results), publicly funded trials would be likely to predominate in the long term. Such evidentiary changes may increase the risk that unsafe drugs will enter the market.76,84 And most,73-75,85,86 but not all,84 studies suggest that shorter review times are deleterious. We propose several reforms to the drug approval process: Firstly, industry funding of drug regulatory agencies should be ended; governments should fully fund agency budgets. Secondly, expedited review should be reserved for drugs likely to offer genuine clinical advances. For instance, “first in class” drugs should not automatically qualify for expedited approval since many are not superior to existing products.7 Thirdly, requirements that trials use hard clinical endpoints and active comparators should be waived only in exceptional circumstances. Fourthly, while experts who receive commercial funding may appropriately offer testimony before advisory panels evaluating drugs, such experts should not be allowed to participate in the panels’ voting or decision making.87 Finally, drugs should be required to demonstrate superiority—whether in efficacy, safety, or convenience of dosing or administration—over any existing agents to be eligible for market exclusivity. We propose several reforms to upgrade postmarketing safety efforts. Funding for such efforts within the FDA and Health Canada should be increased to a level on par with spending for review of new drug applications, and safety offices should have equal position in these agencies’ hierarchies to offices tasked with drug approval. Safety monitoring offices should be empowered to independently order safety warnings and remove unsafe drugs from the market, and agencies should use their legal authority more aggressively to pursue drug companies that fail to complete required postmarketing studies on time. Finally, information about delays must be made publicly available. Drug promotion—including industry “detailing” of physicians’ offices—consumes billions of dollars annually, more than total expenditure on medical student education in the US90-92; expenditures for sales and marketing exceed those for research and development.13 In addition to diverting funds that might be better used to develop lifesaving medications, such promotion is often misleading or inaccurate.93-95 This is especially true for direct-to-consumer advertising (DTC)—now widespread in the US96 and, in attenuated form, Canada.97 Advertising that mentions the brand name of a prescription-only medicine along with its indication is banned in all other developed nations except New Zealand. Improved monitoring should be coupled with stiffer sanctions for misleading or off-label promotion. In the past, even massive fines haven’t deterred industry violations100 because, as one expert noted, “When you’re selling $1 billion a year or more of a drug, it’s very tempting for a company to just ignore the traffic ticket and keep speeding.”101 Hence, authorities should be empowered to suspend firms’ right to promote their products or, in extreme cases, pursue criminal complaints against drug executives. Although our proposal would have large economic and budgetary implications, a detailed examination of those effects is beyond the scope of this article. 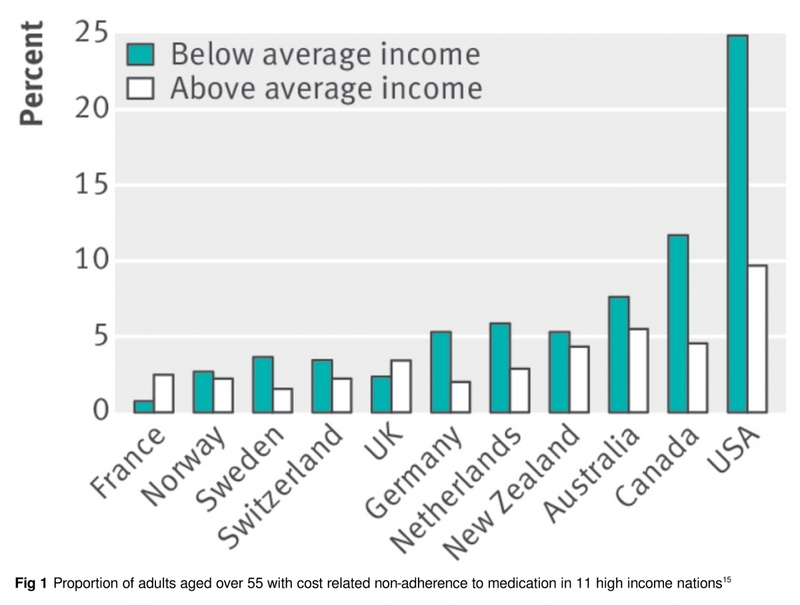 Others have estimated that a national pharmaceutical program for Canada could save $7.3bn of the $22bn currently spent annually on prescription drugs in that nation, although that estimate did not contemplate the new investments in drug research, development, and regulation that we advocate.108 For the US, we believe that savings on drug prices through the mechanisms detailed above could fully offset the added costs of universal, first dollar drug coverage and new public investments that we recommend. Jonas Salk, inventor of the polio vaccine, eschewed patenting, declaring: “Could you patent the sun?” Today, in contrast, profiteering too often reigns, to the detriment of population health. Our proposal calls for a fundamental reorientation of drug policy: it would make drugs more affordable for patients and society, promote innovation, strengthen efforts to assure the safety and effectiveness of medications, and upgrade the evidence available to prescribers and the public. Because drugs developed through the proposed new public pathways would remain in the public domain, they could be produced generically throughout the world, benefiting many nations. The reforms we advocate face formidable political opposition, especially from drug firms, with those in the Fortune 500 in the US alone making total profits of $67.7bn in 2016.37 However, most Americans—both Democrats and Republicans—now favor government action to lower drug prices,109 and 91% of Canadians support a universal pharmaceutical benefit.110 These are unmistakable popular mandates for change. The trail from sentiment to policy will doubtless be arduous. Yet history is replete with examples of sweeping reforms—often enabled by unpredictable shifts in political circumstances—that overcame entrenched interests. 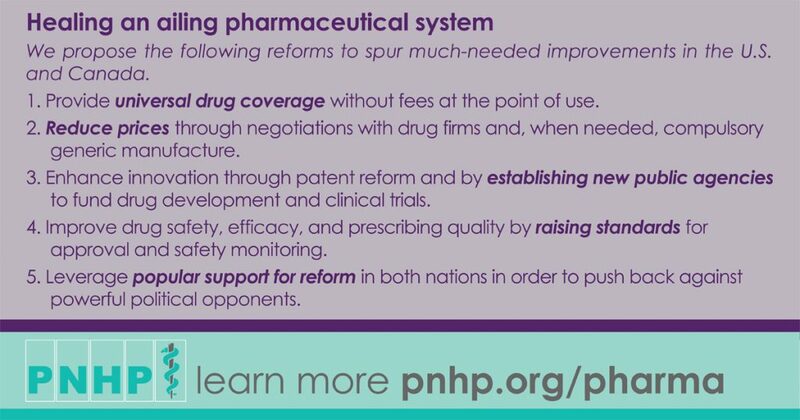 We aim with this proposal to provide a blueprint for reform that anticipates—and may kindle—transformative changes in our nations’ pharmaceutical systems. This proposal was drafted by a writing committee comprising Adam Gaffney (cochair), Joel Lexchin (cochair), Marcia Angell, Michael Carome, David U Himmelstein, Gordon D Schiff, Sidney M Wolfe, and Steffie Woolhandler. Other members of the US/Canadian Pharmaceutical Policy Reform Working Group were: Brook Baker, Monika Dutt, Marc-André Gagnon, Gordon Guyatt, Ritika Goel, Brian Hutchison, Richard Klasa, Michael C Klein, Danielle Martin, Barbara Mintzes, Karen S Palmer, Danyaal Raza, and Robert F Woollard. Competing interests: We have read and understood BMJ policy on declaration of interests and declare the following interests: JL has received payments from non-profits for consulting on projects that investigated indication based prescribing and which drugs should be distributed free of charge by general practitioners. He received payment from a for-profit for being on a panel that discussed expanding drug insurance in Canada. This proposal has been endorsed by Physicians for a National Health Program and Canadian Doctors for Medicare; authors and working group members are active in both organizations. Physicians for a National Health Program is not-for-profit organization that advocates for a single-payer healthcare system for the United States. Canadian Doctors for Medicare is a not-for-profit organization that advocates on behalf of Canada’s public single-payer system. 12. Finkelstein SN, Temin P. Reasonable Rx: solving the drug price crisis. FT Press/Pearson Education, 2008. 13. Making Medicines Affordable. A national imperative. National Academies Press, 2017. 30. Cochrane AL. Effectiveness and efficiency: random reflections on health services. Nuffield Provincial Hospitals Trust, 1972. 32. McKinnell H. A call to action: taking back healthcare for future generations. McGraw Hill, 2005. 37. Ranked within industries. Fortune 2017;500:f33-40. 51. Patented Medicine Prices Review Board. Annual report 2016. PMPRB, 2017. 100. Evans D. Big pharma’s crime spree. Bloomberg Markets, 2009: 72-86. 107. Institute of Medicine. Clinical practice guidelines we can trust. National Academies Press, 2011.